You know, the archetypal movie plot where the people sin and the monster comes to get vengeance. There is no escape. People die because the town is dumping waste, or the mayor cares more about the tourist trade than he does lives...you've seen this movie. The monster, Ebola, broke out in 1976 in Sudan and Zaire (now known as the Democratic Republic of the Congo). Some theorized that the virus hid in the jungle for centuries, and, because of deforestation, it emerged on a vulnerable public. Many blamed the greedy for the deforestation, and thus the Ebola outbreak. Then the hero entered. 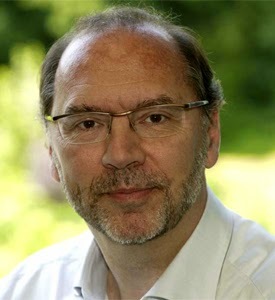 The medical doctor and microbiologist, Dr. Peter Piot, who rode off to the unknown wild to pioneer and discover what was causing Death. Soon, he found out...it was Ebola. Later, he dubbed it, "A spectacular virus." But this hero did not stop there. In 1983, again in Zaire, he pinpointed the AIDS virus as a global enemy, and by 1995, he was the Founding Executive Director of UNAIDS, the UN's organization that focuses on preventing and battling AIDS globally. He could not wait to grow up and leave that town! He left UNAIDS in 2008 to lead the Institute for Global Health at Imperial College London. Currently he is director of the London School of Hygiene and Tropical Medicine. The video below is an interview led by the ever-so-fascinating Christiane Amanpour in July 2014, not long after the most current African outbreak of Ebola threatened to become pandemic. If this were a movie, the good guys win. As Piot states in the video interview above, Ebola isn't hard to contain. It takes just basic medical protocols to keep it from spreading. And now, the experimental treatment he talks about in the video (a drug called ZMapp) seems to be a cure! In August 2014, doctors at Emory University Hospital used ZMapp on the two infected American healthcare workers, Dr. Kent Brantly and Nancy Writebol. On August 19th Writebol was released from the hospital--cured. Dr. Brantly left the hospital just two days later, also cured.